Today, we would like to talk about a miraculous country of Azerbaijan with its unlimited natural resources, centuries-old culture, history and ancient people, whose lifestyle presents a unique and harmonious combination of the traditions and ceremonies of different cultures and civilizations. Azerbaijan is a geographical name. On the one hand this name is linked with the population, which lived in this region for thousand of years before our era, and who were mostly fire-worshippers. Local population considered that fire was their God and so they worshipped the fire. "Azer" means fire. The Turkic name "Azer" was used for this territory for a long time. The word "Azer" consists of two parts - "az" and "er". In Turkic languages, "az" means a good intention and a fate of success. Thus, the word "Azer" means "a brave man", "a brave boy", "the fire keeper". The word "Azerbaijan" originates from the name of an ancient Turkish tribe, who resided in those territories. Azerbaijan is one of the most ancient sites of humankind. The humankind was present here at every stage of their historical development. There were living settlements in Azerbaijan even at the earliest stages of humankind. Azerbaijan made its own contribution into the establishment of the current culture and civilization, progress and dialectics. The time kept a range of ancient archeological and architectural monuments for us. The ancient headstones, manuscripts and models of carpets, preserved to the present times from the ancient ages, can provide much information to those who can and want to read them. If you wish to understand Azerbaijan and to know everything about it, you need to look at this country and its people with a friend's eyes. Azerbaijan is a country of ancient culture. The Oguz tribes which moved here and stayed for ages, have found a deeply rooted culture and in their turn enriched it with Turkic national traditions. The talented and creative powers of our nation are personified in such epic monuments as "Kitabi-Dede Gorgud", "Oguzname" "Keroglu" and many others. This fertile, generous and friendly land was the home of many thinkers, philosophers, scientists, poets, architects, musicians and artists. A legend tells that Zardusht was born in this land. 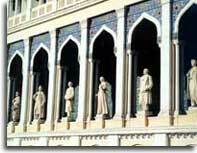 Azerbaijan also enriched the humankind with such geniuses as Nizami Ganjevi, Hagani Shirvani, Bahmanyar, Nasimi, Fizuli, Nasreddin Tusi, Shah Ismail Xatai, Mullah Paneh Vagif, A. Bakikhanov, M.F. Axudov, M.A. Sabir, J.Mamedguluzade, Huseyn Javid, J.Jabarli, Samed Vurgun, Aliaga Vahid, Rasul Rza. The country of Azerbaijan was immortalized by such talented painters as Sattar Bahlulzade, Tahir Salahov, Togrul Narimanbeyov, Mikayil Abdullayev and many others. Our national music - mugam - inspired such outstanding composers as Uzeyir Hajibeyov, Muslim Magomayev, Gara Garayev, Fikret Amirov, Niyazi, Arif Melikov and others to create their masterpieces, which are still known today throughout the world. It also gave the inspiration to such wonderful vocalists as Bulbul and Rashid Behbudov. It seems that the famous Azerbaijan carpets are the incarnation of all colors of nature and of all signs of history. Today, these carpets magically pass the borders of time and space and travel from Azerbaijan to foreign countries far away. The models of the decorative art made by Azerbaijan craftsmen from the metal, ceramic, silk and woods are kept in many museums of the world. The science and the enlightenment in Azerbaijan have a centuries-old history. The Baku State University was founded in 1919; the institutes of the Academy of Sciences of Azerbaijan play an exceptional role in scientific, educational and cultural development of Azerbaijan. Local scientists are currently studying such important issues as the depths of the Caspian Sea, space exploration and the secrets of human brain. The existing educational system of Azerbaijan is made up of dozens of higher educational institutions and technical schools, thousands of high schools, colleges and lyceums. One of the most important problems which is currently solved by local scientists is environmental protection of the Caspian Sea and different regions of Azerbaijan. Such natural reserves as Gizilagach, Shirvan, Zagatala, Aggol, Girkan and others, were established due to the efforts of Azerbaijani scientists. Through the decades, the local industry was successfully represented by oil producing, petrochemical and oil processing enterprises. The agricultural industry is famous for cotton-growing, viticulture, vegetable-growing and cattle-breeding. If one compares the economy of Azerbaijan with a living body, it becomes evident that oil flows in the veins of Azerbaijan. The oil and gas resources of Azerbaijan have made this place famous in every part of the world from the ancient times. 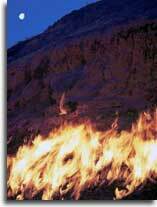 Azerbaijan has always been famous for its sources of eternal fires - the atashgehs. There is a place called Yanardag (blazing mountain) in Absheron and thermal springs in some parts of Nakhichivan, Kelbejar, Masali, Lenkoran, Babadag. In Surakhani, there is an eternal fire place. From the ancient times the fire worshippers from remote places and even the Indian priests were coming to Absheron in search of fire and finding it here. They built their main temples here in Surakhani and Ateshgah. The word Azerbaijan brings its main wealth - oil - before the eyes. Oil is not only the wealth, but the fame as well. People were coming to Azerbaijan from distant places for this specific taste and colored puddle under the ground. Throughout the centuries, camelcades carried waterskins of oil in both eastern and western directions. The Azerbaijani oil is not used exclusively for the electricity production, but also as a valuable medicine for a variety of diseases. There has been an increasing demand for oil throughout the centuries. From the beginning of the 20th century, the continuous industrial development around the world, caused an unprecedented growth of the demand for oil. It was at this time oil turned from an everyday mean into an industrial product. Oil become the most important problem in the world in the 20th century - the century of science and technologies. Oil-producing countries have acquired special oil policies and oil strategies in this connection. Azerbaijan is currently involved into the implementation of huge energy projects. 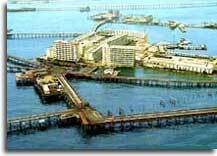 Oil and gas projects are successfully implemented in the Azeri Caspian sector. Azerbaijan is a country, which plays an extremely important role in the Caspian and Caucasian regions, particularly in the development of transport infrastructure in the Caucasus and the implementation of energy projects. It was the region's first country to explore the huge energy potential, to form an absolutely new economic model in the regional development, and to expand political and economic relations between Europe and Asia. In spite of the sad results of Armenia's aggression against Azerbaijan (Armenia occupied the territory of Nagorny Karabakh and 7 neighboring districts. 1.4 million out of total population of 9.5 million are refugees. ), our country mobilized its potential and had great successes in building democracy. Azerbaijan manages to successfully overcome the difficulties and continues making important and firm steps towards t he establishment of a democratic and lawful country with civil society. 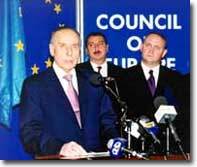 Azerbaijan has membership in the United Nations (UN), Organization of Security and Cooperation in Europe (OSCE), Council of Europe (CE), Commonwealth of Independent States (CIS), GUUAM, Organization of Islamic Conference, Black Sea Economic Collaboration (BSEC), Organization of Economic Cooperation (OEC). Azerbaijan also actively cooperates with the European Union, NATO, International Monetary Fond, European Bank for Reconstruction and Development, Islamic Development Bank and other organizations. It accedes to the new joint documents and international agreements. I. State symbols of the Republic of Azerbaijan shall be: the Republic of Azerbaijan Flag, the Republic of Azerbaijan Emblem, the Republic of Azerbaijan National Anthem.II. The Flag of the Republic of Azerbaijan shall consist of three wide stripes. The upper stripe shall be of blue colour, the middle stripe shall be red and the lower one shall be green. There shall he a white crescent and eightpointed star in the middle of the red stripe on both sides of the Flag. The proportion of the width to the length shall be 1 by 2. III. The design of the Republic of Azerbaijan Flag and the Republic of Azerbaijan State Emblem, the music and the text of the Republic of Azerbaijan National Anthem shall be defined by the Constitutional Law. On November 9th, 1918 government of Azerbaijan Democratic Republic adopted resolution on national three colored flag. After the fall of ADP on April 28, 1920 and establishment of Soviet power in Azerbaijan this flag was rejected.On November 17, 1990 three colored flag was for the second restored in its rights by the resolution of Supreme Majlis of Nakhichevan Autonomous Republic and accepted as national flag of Autonomous Republic. At the same session Supreme Majlis of Nakhichevan solicited Supreme Soviet of Azerbaijan SSR for recognition of three colored flag as a national symbol of Azerbaijan.On February 5, 1991 Supreme Soviet of Azerbaijan Republic considered a solicitation for recognition three colored flag as a National Flag of Azerbaijan.National Flag of the Republic of Azerbaijan consists of three equal in length horizontal stripes. The upper stripe is blue, middle is red, lower is green colored. Blue color has meaning of Turkic origin of Azerbaijani nation, red color has reflects the heading to modernization of society and development of democracy, and the green color shows belonging to Islamic civilization. In the center of red stripe on both sides of flag there is white crescent and eight-angled star. Proportions of width of the flag to the length is 1:2. On January 30, 1920 government of Azerbaijan Democratic Republic adopted resolution on announcement a competition of the best National emblem of republic. It was mentioned in the resolution that adoption of the emblem will be on May 28. But in the result of fall on April 28, 1920 of Azerbaijan Democratic Republic emblem wasn't adopted. On November 17, 1990 Supreme Majlis of Nakhichevan AR, after having discussed question on National emblem solicited Supreme Soviet of Azerbaijan SSR on announcement a competition for processing the National emblem of Azerbaijan. Competition was announced on February 5, 1991 according to resolution of Supreme Soviet of Azerbaijan Republic. During 1991-1992 there were tens of projects of new National emblem, on discussions there were also suggestions on adoption on the projects designed in 1919-1920. On January 19, 1993 Supreme Soviet of the Republic of Azerbaijan passed Constitutional Law according to which project of National emblem of 1919-1920 with some changes was adopted. National emblem of the Republic of Azerbaijan is the symbol f sovereignty of Azerbaijan state. National emblem represents an image of oriental escutcheon, placed on the arch composed of oak branches and ears. On the escutcheon in background of colors of National flag of the Republic of Azerbaijan there is image of eight-angled star and in the center of star there are tongues of flame. on the walls of buildings of diplomatic and trade representatives of consular offices of the Republic of Azerbaijan . The heroic patriotic glorious land! To die for you we are glad and we are ready! With three color banner live happily! Every soldier to front has gone! When your chest was field of battle! Come back as a heroic son! Be mightier we do wish! All the youngsters are too glad!